1. 16 July was the starting date in China. The tour was organized by Dr. Alexander Khalil, alexkhalil@gmail.com. This event featured myself, Alex and 如山 Rushan (賈瑀鉉 Ka Woo Hyun, from Korea but for many years based in Beijing), who was the other featured teacher on the tour. 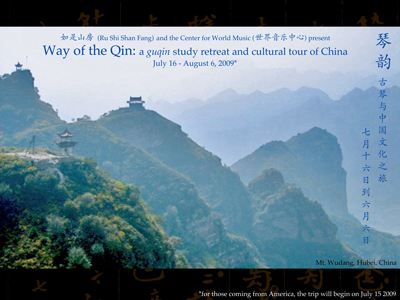 As of 9 July 2009 the Rushi Shanfang blog site had a poster of this event, together with listings of other events and a recording by an unidentified guqin player. Their website has no map, only a description giving the address and saying they are about 200 meters west of Exit A at the Yonghe Gong stop on subway line 5 （地鐵5號線雍和宮站A出口向西約200米). Tel ☎（010）64025766. The map (downloaded from the internet; see also images) shows it (address: 西杏石口路 West Xingshikou Road 甲30#) to be west of the 四季青橋 Siji Qing Bridge, an overpass along a northern part of Fourth Ring Road West. The building is apparently also called 坦博艺苑，又叫徽园, the latter coming from 徽園大祠堂, its name when it belonged to a wealthy Anhui merchant. Perhaps 300 years old, it was imported from Anhui to Beijing before the Olympics and turned into an art studio and performance center. Our Wudang Shan activities centered around 紫霄宮 Zixiao Gong. See website. Head: 徐君躍 Xu Junyue. See website. Head: 徐曉英 Xu Xiaoying. Organized by 汪鐸 Wang Duo at 天闕會 Tianque Hui, a new center within the 蘇州太湖國家旅遊度假區 Suzhou Taihu National Tourism and Vacation Zone (環湖大道199號); the activities focused on silk strings and reconstructions from Xilutang Qintong. Meetings with the 金陵琴社 Jinling Qin Club (Head: 劉正春 Liu Zhengchun) and the 幽蘭琴社 Youlan Qin Club (Head: 馬傑 Ma Jie). Finding people to comment on my new qin with a piezo pickup. The map first loads without the itinerary - you may have to wait a bit longer for the itinerary itself to load.